I really haven’t been one to add “textures” to my images. Not that I don’t like them. I’ve seen some that have just been overdone, that seem to take away from the image itself. It really is a question of personal preference. I have also seen some really great images that have been given that old, antique, worn out look, and done in such a way that it is beautiful. For Picture Inspiration this week we were given the challenge to try applying a texture…and here you have my experiment. To learn more about Kim and her texture techniques click here. Meanwhile, I have been working on my gratitude journal each day, doing some writing and some dabbling in paint, glue, colored pencils, water color crayons… and having a blast. I hope to have the images up tomorrow to show. Just waiting for stuff to dry! 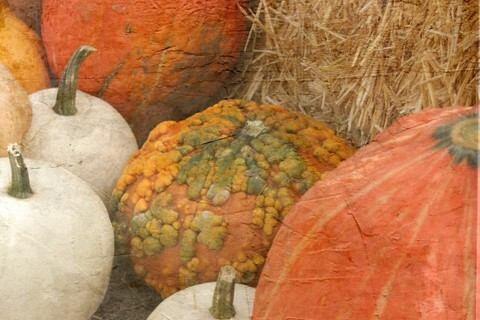 I love all the textures on pumpkins, look at that bumpy one!! I like textures and the different way we see them and appreciate them. Have fun exploring this side of you, I'm sure you will find wonderful things about you and your subjects. Looking forward to seeing your journal today. Well done! 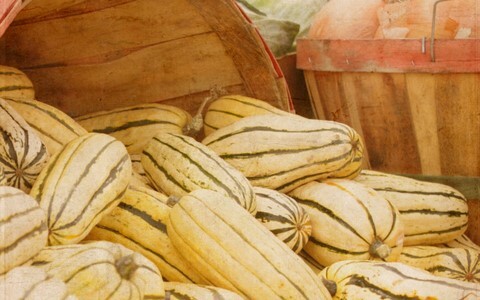 I think your texture treatment enhances the natural textures of the ghourds and pumpkins. Adding textures is something that takes experimentation, just as you are doing. Beautifully done, Deb! I've learned applying texture from Kim and since then I'm pretty hooked to that. Sometimes I like to add a little bit, sometimes a lot. It really depends. As you said, one can overdo it (and I certainly did several times!!! ), but it can also add a really nice touch to an otherwise plain photo.